It was a quiet week here in Lake Wobegon; wait, a different movie… The Artful Dodger was really a bit too obvious to be that artful. And once I let him pass me I also realized he had a bleak and slimy little sidekick behind him of about 12 or 13 yrs old; most likely an apprentice in the trade. Walking a main avenida in Otavalo, I was returning from the market up the street, the market where the Otavaleños buy their stuff as opposed to the main market where the gringos are separated from their cash. Not particularly engaged, I was window shopping, carrying a bag of fruit I had just purchased and kind of ambling. Andando-ing and Pensando-ing one might say. In spite of the glaucoma, my peripheral vision is still pretty intact and I kept seeing the same shadow a few storefronts back, keeping the same distance regardless of my pace. So after a block or so of this ridiculousness I stopped, leaned against the wall of the store I was passing and allowed them to pass me. With their studied indifference and a new-found interest in pieces of their own clothing, the 2 walked on by, so I crossed the street and followed them. Eventually they came up to the main market, which by now, nearly 5pm, was closing down. They met up with some other low-rider-pants types who were hunkered down, gambling on the sidewalk. Do, be careful folks. You’re a target simply because you’re a gringo and never believe otherwise. Otavalo is guide-book famous for its pickpockets, though this one should file for unemployment. I mean really. I was headed to the Tourist Information Office, staffed by congenitally friendly folks who are honestly hoping that we discover the treasures of this place. And I know that I certainly am. So when you’re next in a foreign clime, stop in and make it a point to muddle your way through the language and see what tourist office folks have for you. For me, it was the second time meeting this particular agent and our professional relationship was growing noticeably warmer. Earlier I had helped him with his English translation of a city Inti-Raymi guide which had pleased us both. Juggling constant interruptions from folks off the street, he was ably and engagingly informing me of the Festival of San Juan, held in a village a 10-minute walk from Otavalo. He explained that the dance competitions, celebrating the cosecha, or harvest, were fascinating and often hilarious. However, there was always the chance for a life-threatening element of danger. He warned that that ole devil likker was ever-present during these fervently religious observations and often the competitions turned unruly with escalating salvos of rock-throwing. (Is it as interesting to you that my explorations, only and universally filled with love and peace, using various entheogens are frequently condemned while such anger, hatred, and even killing are tolerated in the name of organized religion? OK, enough.) The competitors and bystanders (nobody’s immune with a bellyful of booze) both infrequently and too-frequently land in the hospital and/or the morgue. What can I say? I’ll be reporting live from the scene. 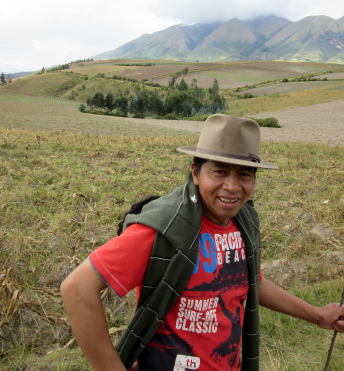 Joselito, the hostal owner’s brother and right-hand man, is my assigned guide into the mountains around this Valley of the Sunrise, as it’s called by locals. The area is noted for its hiking excellence in every guidebook ever written about Ecuador. And hiking has been a favorite lover since my crass and craven youth. However I am traveling solitario and had gloomily believed that this particular affair was to be off-limits. Even as the actual trails nearby are never technically challenging, flirting with my 7th decade and finally admitting physical limitations brings a sensibility that I never thought I’d be saddled with. And walking alone in the wilderness, often near 4,000 meters elevation, I just will not do. Oh, well. Whining about my lost love to Jose Miguel and Matilde, they immediately assured me that my pining was not in vain and volunteered Joselito, who merely stood there grinning and nodding yes. Those twins, serendipity and synchronicity, were playing cupid with my passion for being afoot in the hills. Yesss! Matilde and I will meet later today to construct my schedule for the time I’m in their care. The 3 of them have an almost limitless number of suggestions, and I must be sure that as we schedule, we also include events that I have already decided that I want to see. So we’ll negotiate my future, but after breakfast. 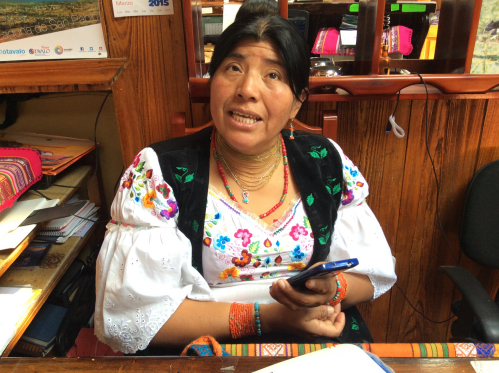 This entry was posted in Indigenous, Otavalo and tagged Ecuador, Kichwa, Kitchwa, Otavalo, Quechua on 2015-06-24 by kmalivuk. compliments on your writing, etc. Your parenthetical dichotomy is interesting, (puzzling) to me. Also puzzling, why is devil likker such a recurring feature of religious festivals (Guaranda, Otavalo…) when cannabis, coca, and SanPedro are available? I, for one, am glad to hear that you have a sensibility that you thought you’d never be saddled with. Also glad that folks such as Joselito and Dona Matilde stepped up to give you a hand. The photo of J (Im liking the fedora and surf tee) made me think of Gary P. The snap of Matilde (liking the beads and blouse) brought Cindy to mind. Those twins of yours seem to be around every other corner I turn lately. Sometime lets have a bs session re Tolle, De Mello, Jon K-Zinn, Marshall Rosenberg, Ram Dass, et.al. The other names I’ve heard, but Rosenberg not. Who/what/where/when? Why matters not. What’s the haps on the Windward side? Windward haps hmmmm You want macro or micro? Lena’s nursery Happy Plants is steadily a-growing. Girl’s knocking herself out. Still got big time permitting prob w/ the house construction. We may be able to enclose (1 story) half of the slab outside the kitchen door soon. More bureaucratic insanity but at least somewhat in our favor. Waimanalo Beach was rated no. 1 US beach on some Florida dude’s annual list. Kailuakiki continues to host growing throngs of happy vacationers of diverse national origin.